Dolav has replaced ten percent of factory electricity with clean solar power. 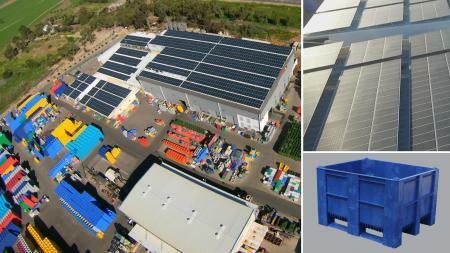 This plastic pallet box maker now capitalises on Israel’s abundant sunshine with 2000 solar panels on 4000 sq. metres of sun-drenched factory roof space. Dolav's $900,000 investment will pay back in just seven years after a team installed the 0.3Kw panels in only three months. At its site in southern Israel, Dolav has made heavy-duty plastic pallets and box pallets since 1976 and sold them globally for 40 years. Customers use Dolav hygienic plastic box pallets widely in the food and fish processing sectors and to handle by-product or waste for recycling. Used throughout many commercial sectors around the world, Dolav box pallet products are so widely used the word ‘dolav' is now the generic word for box pallets made of plastic, wood or metal. However, only Dolav makes genuine, strong, food-grade, injection-moulded Dolavs, now with the help of solar power.